I just love Fall fashion. We aren’t quite there yet but you know that there’s nothing that gets a girl more excited than whipping out some peep toe booties and showing off some fashion ideas for the upcoming season. I LOVE the summer – don’t get me wrong. But my heart belongs to the transitional seasons. For my first outfit, I opted for a pair of black skinny jeans (a MUST in every girl’s closet), a patterned boxed sweater and Marc Fisher suede peep toe boots from QVC Shoes. I LOVE to mix black and brown together. A lot of people are opposed to it. I say, don’t be afraid and run with it! 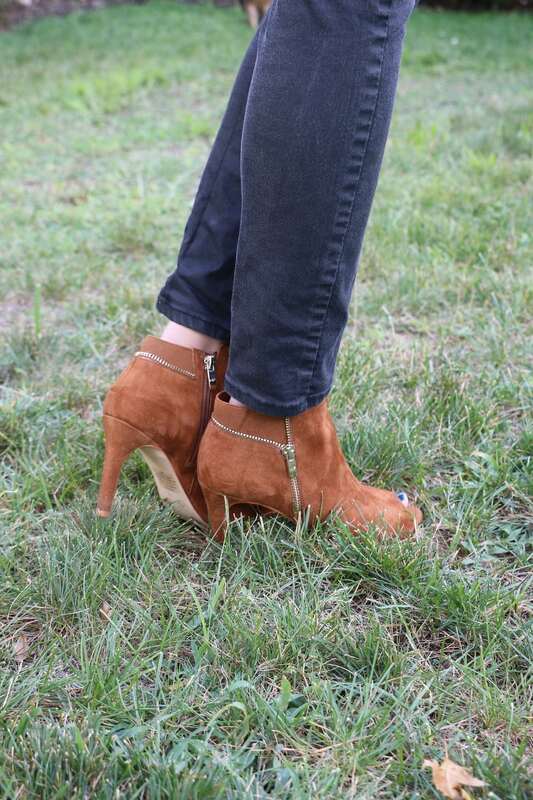 Peep toe booties are the ultimate accessory because you can wear them during every single season of the year. Whether you are meeting up with girlfriends for a night out in July or if your grabbing drinks with co-workers after a big meeting in February – they just make sense! 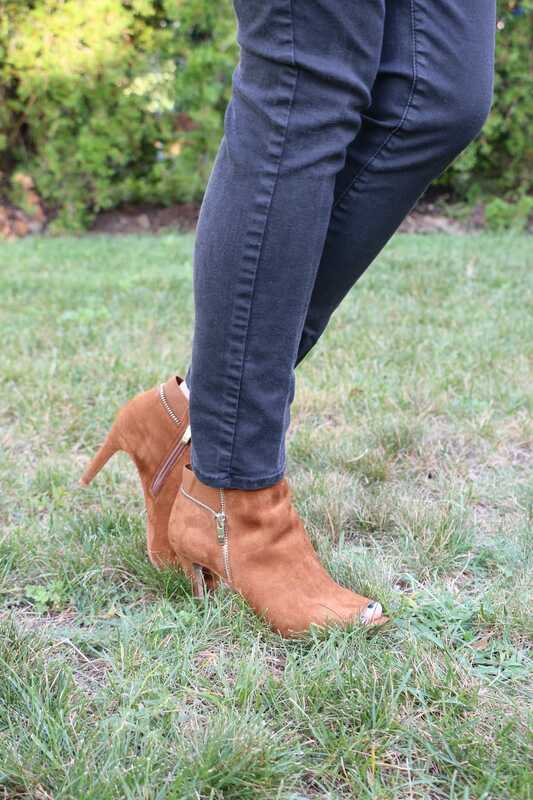 These Marc Fisher booties have an extra decorative detail — the zipper! I love the finishing touch. So what do you think? Remember to catch your new must-have accessories this season with the Marc Fisher Collection at QVC. With a background creating best-selling collections for many leading designers, Fisher believes that “style that lasts is style that counts” and aims to fill your closet with classic, wearable shoes that never go out of style. Luxurious yet affordable in lavish leathers with a wealth of contemporary silhouettes, Marc Fisher Footwear give you that casual-luxe look you crave. You’re sure to find your perfect go-to accessories for any occasion and fill your wardrobe with understated classics. ******To pick up these amazing Marc Fisher Serneity Peep Toe boots, click here!!! What do you think about my two looks? * Lady and the Blog LLC received product and compensation for this review post. Previous Post: « Lands End: Back To School Looks – Head To Toe!